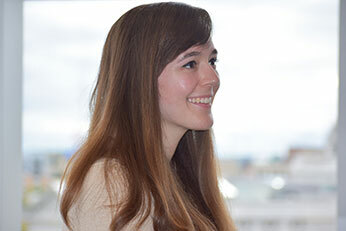 Brittany Hoban is a graphic designer for the IH Concepts team. She was originally from the Milwaukee area and has always been an artist with a creative mindset. Brittany’s journey started when she went to Madison College to pursue her passion for art and graphic design, after she studied chemical engineering and psychology previously. Her potential was recognized immediately during her time as an intern, and her approach to design, branding, and style made her an excellent fit for the graphic design team. After her internship, Brittany was offered the opportunity to keep working with us. Brittany’s goofy and fun personality makes her a great person to work with. She is always making those around her smile and brightening the day of those she meets. When she isn’t at work, Brittany is likely catching up on twelve different TV shows, exploring some part of the world in a book, or getting some well-deserved sleep (just kidding, that’s what caffeine is for). What is your favorite summertime food? If you were on a road trip tomorrow, where would you go? If you could invent a new contraption, what would it be?